Luxurious 4BR/3BA Villa with Pool and Spa - 3 Miles to Disney! Our beautiful Villa is situated on the exclusive luxurious resort of Emerald Island, a brand new tropical oasis with all the on-site facilities you could ever imagine, exclusively reserved for our residents. The winding, palm-lined road that leads you to this beautiful resort is a prelude to the community's grandeur. Beautifully landscaped with tasteful architecture, Emerald Island makes the perfect haven after a day at the nearby attractions or shops and offers the luxury and privacy of a gated resort lifestyle in a secluded location, less than 3 miles to all the magic of Disney (just off the 192 and West of I-4) and close to all the other Florida attractions and amenities. 3 bathrooms, pool & jacuzzi, games room, and much much more! 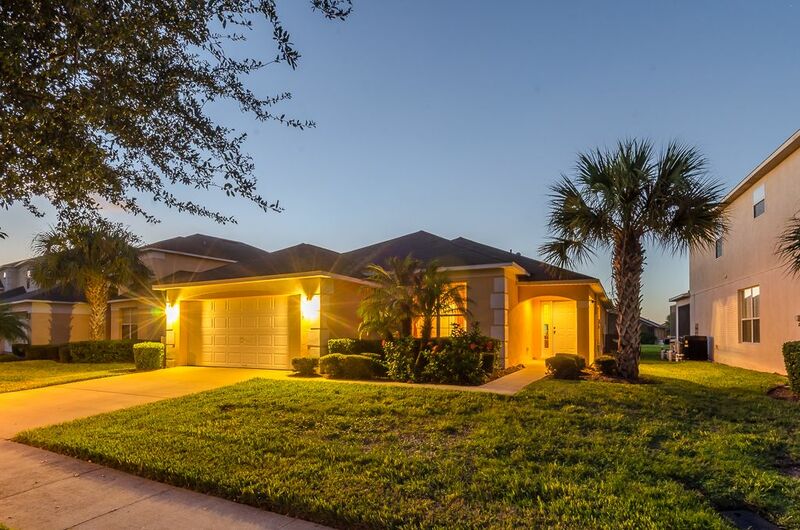 If you have been looking for a holiday home close to Disney, Emerald Hunny Pot Villa will more than meet your requirements, as it is located on the closest private resort to Walt Disney World. Inside Emerald Hunny Pot Villa, you will find all of the latest features in vacation rentals. Constructed in 2004, all rooms are spacious and tastefully decorated with a very high standard of furnishings throughout. With 4 bedrooms/3 bathrooms, which include 2 master suites (one king and one queen, with en-suite facilities and walk-in closets), 2 Disney themed bedrooms especially for the kids and a pull out queen sized sofa bed in the living room, this villa will make the perfect vacation for any size family/families or group of up to 10 guests. Our dining room features a dining table with 6 chairs, and another dining area including table with 4 chairs which is great for the children. There is also a breakfast bar with bar stools. Our beautiful home also includes a fully screened custom built heated private pool with raised spa, and a games room. You’ll find the freedom to do what you want, and when you want, vitally important. This is particularly true for those holidaying with children. We have a young baby of our own and are used to travelling, so with this in mind we have tried to make our house as child friendly as possible with lots of free extras (eg cot, highchair, lightweight foldaway pushchair/stroller, toys, board games, PlayStation 2, X-Box, DVDs and CD's for all the family. Provision of a safety barrier for access to pool and spa, and of course there are 2 on-site children's play area. When you arrive you will save time as you will not need to go and collect the key from an agent (often 30 mins from the villa). You have all the freedom to do as little as you please or as much as time allows. With all the comfort of home and more than a few holiday luxuries thrown in for good measure, we are sure you’ll find your stay at our villa one to remember. Seats 10 for dining, 6 on main table and 4 in the nook. 3 sets of golf clubs, Air Hockey Table, Pool Table, Tennis Table, Football Table, bike, childrens toy boxes, PS2, X-Box, DVD's and much much more! Excellent experience from start to finish! I like the house with key code entry instead of pick-up / drop-off the key at the management office for the convenience. The owner has good response when I had several questions, and it helped me to prepare my trip and stay at this house. If the heating pool/spa rate information was listed in the Home Away website already, that would be very convenient to plan in advance as well. Nice , very clean and close to the parks. It was exactly what we need it, plenty of room for 10 , it was very nice and clean . It's close to the Park's and plenty of restaurants. We had a great time and would highly recommend your villa to anyone. Everything we needed and more was there. Can't wait to go back again soon. As you drive towards Emerald Island, you could be forgiven for thinking that you are approaching the gates of heaven. There is an immediate feeling of peace and tranquillity which is further enhanced as you progress down the palm tree lined road towards the entrance. The award winnig Emerald Island is and exclusive gated community, surrounded by an excess of 300 acres of beautiful conservation wet lands. There are also 11 beautiful heavily wooded areas within the resort. It is surprising that such beauty is only 2 miles away from the Disney resorts and even closer to a vast array of restaurants and shops. Emerald Island has achieved its premiere resort status by using its beauty, amenities and because of its location, location, location!! Once you enter the spectacular gatehouse, the Villas (and townhouses) at Emerald Island resort sit adjacent to the community clubhouse and the lavish swimming pool, both reserved exclusively for residents. Beautifully landscaped with tasteful architecture, Emerald Island makes the perfect haven after a day at the nearby attractions or shops. Being so close to all the major attractions you may want to pop home at lunchtime for a bite to eat or a swim in the pool, before you return to the theme parks later. There are 3 beautiful lakes spread over the resort and the Clubhouse is close to an on site nature trail for walking, jogging, biking or even just taking a simple picnic, winding through Emerald Island’s natural woodland setting. Emerald Island offers the luxury and privacy of a gated resort lifestyle in a secluded location, near to all the magic of Disney and the other Florida attractions. Free use of sun loungers and a large deck area make it a perfect spot for a day's sunbathing. The staffed clubhouse will provide towel service, music at the pool and other thoughtful touches to help make your stay a memorable and worry-free one. Emerald Island makes an ideal base for your Orlando holiday and has a lot to offer any holiday maker. It is located off Highway 192 West at Mile Marker 4 – approximately 35 minutes from Orlando airport. To get to Emerald Island, from Mile Marker 4, you take a left turn (at Orlando Harley Davidson shop) and follow Formosa Gardens Blvd for ½ mile to the junction with Funnie Steed. Turn right and continue on Funnie Steed for ½ mile and the entrance to Emerald Island is on your left. Come to a place where there is excitement around every corner. Were world famous attractions amaze all visitors - both young and old. Orlando, a destination beyond imagination, is a holiday you and your children will never forget. But do not just book a hotel room, why not book yourself a private villa where you, your family and friends can enjoy the space and luxurious surroundings that you deserve. Picture yourself leaving the theme parks after an enjoyable and exhausting day and then just 15 minutes or so later relaxing in the privacy of your own pool sipping ice cold drinks – how lovely! Imagine lounging by a crystal clear private pool in the glorious Florida sun! You are near all of the finest restaurants and shopping that Central Florida has to offer. You are only a short drive from gorgeous sandy beaches on either the Gulf or Atlantic coast. You are also so close to the major attractions that you can hear the nightly firework displays! We welcome you to enjoy the space our home offers and see how it can enhance your vacation! No more going to bed when the children do, you can stay up after they all go to bed in their own room! What is better than having the pool all to yourself in your own back garden! No dragging towels and such down to the pool, just open the sliding doors and there you are! So easy to keep an eye on your children swimming! With 3 full Bathrooms, there is no waiting in line! Our kitchen is fully stocked so you can eat in, eat out, or have dinner delivered! You are totally in control. You can have breakfast at whatever time you like and even in your PJs if you feel like it! You can swim in your own pool when and at what time you like. You can wash that favourite item of clothing so you can wear it again. You can let the children and the teenagers play in one of our bedrooms on the PS2 or in our fantastic games room and still enjoy the villa and comforts of home while learning what it's like to live as a local in Florida. Our home is so close to everything you could want to do on your visit to Florida. Villa holidays provide an enormous amount of freedom, privacy and a home from home convenience too. Villas enable you to live at your own pace, and not be dictated to by a hotel’s layout or its restaurant opening hours. Go on, imagine yourself! It is true that once families have stayed in a villa for a holiday, they rarely go back to a hotel. Why don’t you give it a try for yourselves..! !